The tragic death of President John F. Kennedy still looms large over the consciousness of the American people. Now, you can own an instrumental piece from our 35th president’s last living day. The diving board that JFK died on after trying to do a back dive is officially up for sale. 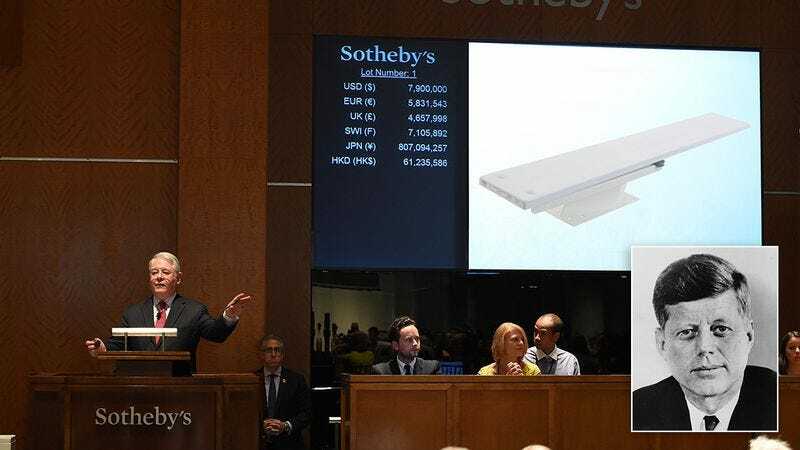 Sotheby’s auction house in New York announced today that the infamous pool platform is now being auctioned to the highest bidder, with a starting price of $500,000. It’s a big price tag for a big piece of American history. It’s a moment that is undoubtedly etched in the minds of those who were alive at the time. On a warm summer day in 1963, President Kennedy went for a dip in the pool at the Beverly Hilton in Los Angeles. Around 3:34 p.m., Kennedy walked to the edge of the diving board, announced that he was going to do a back dive, and jumped into the air. But as the president arched backward, he didn’t get enough distance from the lip of the diving board and came crashing down on it headfirst, breaking his neck and dying instantly. In a second, the course of our nation’s history—and world history itself—were irrevocably altered by a 6-foot-long aluminum reinforced recreational diving board. Who knows what the world would be like today if Kennedy had managed to clear the board, or even simply chosen to attempt an easier dive, like a front flip or a cannonball? Would we have stayed in Vietnam? Would we have faced another nuclear standoff with Russia? It’s impossible to say. This is the first time the diving board that Kennedy fatally biffed it on has ever been put up for sale. Following the tragic accident, it was removed and briefly put on display at the Smithsonian. Eventually, it was returned to the hotel, where it sat in storage collecting dust for more than half a century. But now, the hotel has put it on the market with an asking price of half a million dollars, hoping to find a buyer capable of performing a much-needed restoration of the board and ensuring its historical preservation. Can you imagine owning the actual diving board that claimed the life of JFK on that fateful August day? That would be insane.